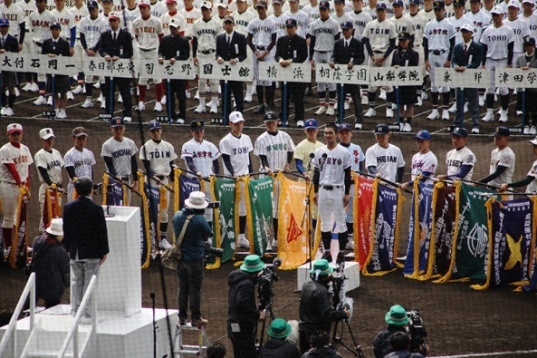 The 91st National High School Baseball Invitational Tournament (“SENBATSU“) got underway on March 23, 2019 at the Hanshin Koshien Stadium in Nishinomiya, Hyogo Prefecture. The SENBATSU was held in 1924, seven months after the Great Kanto Earthquake, with a break during the World War II, and restarted in 1947 after the War. For this year’s tournament, 32 teams will play knockout competion for 12 days to April 3, inclding a day of recess. The participating teams comprise the winner of 2018 Meiji Jingu National Championship, 3 high schools nominated in the special “21st Century selection” slot and the 28 under ordinary selection. The number of high school baseball clubs in 2018 academic year stood at 3,971 across Japan with 153,184. The ratio of students who continue to play baseball from their first through third year of high school has also risen to about 91 percent. Elsewhere, The Japan High School Federation (JHBF) revealed the names of 13 panel members to assess ways to protect the arms of young players which include orthopedist, a lawyer and former athletes. The “Prevention of Pitchers’ Injuries” panel will propose its recommendation by early November after 4 joint meetings beginning with the first meeting on April 26 in Tokyo. The panel members include Ms. Taeko Utsugi (WBSC Executive Board Member At Large), Satoru Komiyama (Waseda University Coach, formerly with NY Mets), Kazuhiro Tanabe (Bone & Joint Japan), Motonori Watanabe (formerly Yokohama High School coach), Eisuke Okamura (Lawyer, former Kyoto University player), Dr. Mikihiko Watanabe (Orthopedist, Baseball Federation of Japan) and Dr. Takashi Masatomi (Orthopedist, JHBF).